Shakopee (MJN), USA — Emerson has launched a dedicated version of its Rosemount™ 5408 Non-Contacting Radar Level Transmitter to meet the specific demands of bulk solids level measurement. Through advanced technology and Human Centered Design principles, the SIL 3-capable device delivers enhanced accuracy, reliability and ease-of-use, supporting improved process optimization and plant safety across a wide range of industries. Measuring solids level in vessels, bins and silos presents various challenges, the most fundamental of which is the inclining or sloping nature of the material surface. The peaks and troughs of uneven surfaces deflect energy away from a radar signal and can generate false signal reflections which affect measurement accuracy. By using a signal processing algorithm that merges surface peaks, the Rosemount 5408 provides a high level of accuracy. The device’s two-wire Frequency Modulated Continuous Wave (FMCW) technology produces a continuous echo to maximize radar signal strength and produce a more robust and reliable measurement. Rosemount™ 5408 Non-Contacting Radar Level Transmitter. The considerable amount of dust created during the fill cycle in solids applications creates a further challenge for measurement technology. Non-contacting transmitters usually handle dust in the vapor space well, but a heavy layer of dust on the antenna could block the signal. The Rosemount 5408 overcomes this with an integrated air purging system for cleaning the antenna. 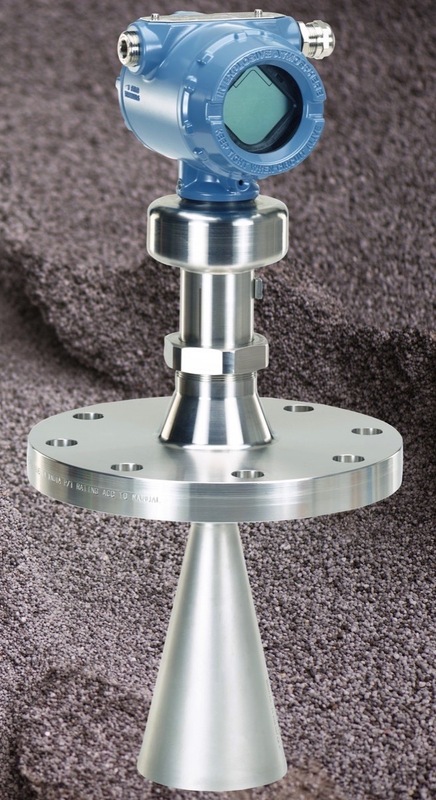 Advanced surface tracking and a condensation-resistant cone or parabolic antenna enable the Rosemount 5408 to provide reliable measurements in very demanding applications. In addition, radar-on-chip technology replaces a circuit board, removing sources of EMC noise which cause signal disturbance, and leading to improved measurement accuracy and reliability. To further enhance device reliability, a unique embedded power back-up removes vulnerability to intermittent power losses. Two-wire technology enables simple installation – using the plant’s existing cable infrastructure rather than having to lay additional cabling – while still providing the same high amount of data and diagnostics that would normally require four-wire connections. ATEX and IECEx approvals allow installation in hazardous locations and the device’s SIL 3 capability enables seamless integration into safety instrumented systems, supporting efforts to increase plant safety. The Rosemount 5408 employs Human Centered Design principles to enhance ease-of-use. Pictorial instructions and a highly intuitive software interface guide the operator through installation, commissioning, proof-testing, operation and maintenance. Advanced on-board diagnostics support preventative maintenance and provide actionable information, streamlining the troubleshooting process. The ability to perform proof-testing and site acceptance tests remotely saves time and increases worker efficiency and safety by keeping them out of hazardous areas.